Path to priesthood: Br Joseph Maria Buckley (right), of the Order of St Paul the First Hermit, following his ordination to the diaconate pictured with his brother Br Matthew Buckley, of the Brisbane Oratory in Formation. Br Joseph Maria will be ordained a priest on June 9. MICHAEL Buckley has waited 20 years to become a priest and now the “exciting and very terrifying” day is just around the corner. 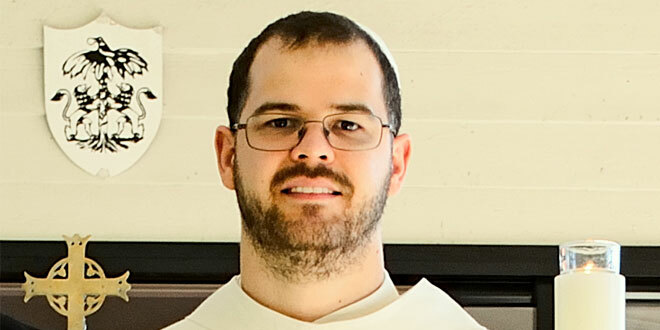 Known by his religious name as Brother Joseph Maria, the 28-year-old deacon will next month become the first Queensland priest for the Order of St Paul the First Hermit, a monastic order founded in 1215. Bishop Columba Macbeth-Green, a Pauline Father who served as the order’s provincial in Australia, will ordain Br Buckley on June 9 at Marian Valley in Canungra. Br Buckley will be the first priest ordained by Bishop Macbeth-Green, who lived in the Marian Valley community before being called to shepherd his home diocese of Wilcannia-Forbes. It will be a special occasion as Bishop Macbeth-Green was rector of Marian Valley when Br Buckley inquired about joining the order as a teenager. “At the end of my school years, when I was about seventeen, soon to turn eighteen, I went to Fr Columba for an interview about joining the order,” Br Buckley said. Br Buckley studied and received a degree in Information Technology before joining the order at 21. While Br Buckley has spent seven years formally preparing for the priesthood, in reality, it’s been a 20-year journey for the Brisbane native. “When I was about eight years old I realised I had a calling to the priesthood,” he said. “I think the reason it happened around then was this was a time I started to become an altar boy, I received my first Holy Communion, and my level of involvement in the Church had increased. When, as a teenager, he asked God where he should be a priest, he found the answer at Marian Valley. His family were members of a homeschooling group that often met at Marian Valley. After joining the order, Br Buckley spent one year in the order’s motherhouse, Jasna Gora Monastery in Czestochowa, Poland, the “fortress” of the famous Black Madonna icon. He then spent five years studying philosophy and theology at the Angelicum in Rome. He has spent the past year working in the Pauline Father’s Australian parishes in Penrose Park and Canungra “learning more about the practical elements of what goes into our ministry”. Unlike other monastic communities, the Pauline Fathers operate Marian shrines around the world, tending to thousands of pilgrims who seek prayer and solitude. This will become one part of Br Buckley’s pending priesthood, which he can’t believe is one month away. “When I first became a deacon, for the first few weeks of that, I thought, ‘Am I really doing this?’,” he said. “And it’ll be the same thing when I’m ordained. “It’s very exciting and very terrifying at the same time. “All this time you’ve spent building up and waiting for this, and finally it’s just over a month away. Once he is ordained, Br Buckley will keep an eye out on his younger brother Matthew Buckley, who is studying for the priesthood with the Brisbane Oratory. When asked what would be his advice to other young men discerning their vocation, Br Buckley said people were “looking for too much certainty”. “The problem these days is a lot of people are looking for too much certainty, looking for a thunderbolt from heaven saying ‘Go to the seminary’,” he said. “God doesn’t work that way – He wants us to respond with faith. “God leaves enough room that he asks us to lovingly respond in faith to his call. Br Buckley’s priestly ordination is open to the public and will be held on June 9 at Marian Valley, Canungra, at 11am.